The 2019 UCLG Executive Bureau meetings is celebrated from 4 to 6 April in Buenos Aires and Montevideo. The formal session of the Executive Bureau will take place at the headquarters of Mercosur during one single day, on 6 April, at the kind invitation of the Mayor of Montevideo and Vice-President of Mercociudades, Daniel Martínez. This is back to back with the UCLG Culture Summit, taking place in Buenos Aires (Argentina) from 3-5 April, and in conjunction with meetings of Metropolis, UCCI and Mercociudades. For the first time, the UCLG Culture Summit will count with political debates hosted by the Policy Councils of UCLG, which usually take place within the framework of Executive Bureau and World Council of UCLG. In this context, three of four of the policy councils of UCLG will become Summit sessions and cultural issues will be discussed in each one of them. 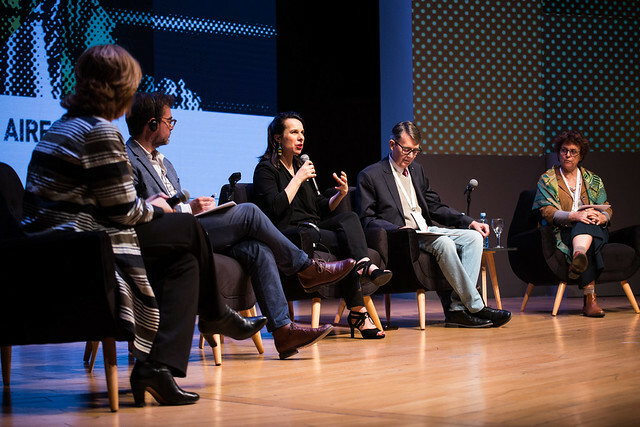 The first day of the UCLG Culture Summit began in a unique setting in Buenos Aires, at Usina del Arte, with an opening plenary in which the idea of culture as the fourth pillar of sustainable development was highlighted. It is, after all, in the spaces of encounter with others that only happen in cities, and where diversity and respect makes ideas flow and creativity expand. "Culture needs to reach everyone. I ask you to walk around Buenos Aires and take in this cultural spirit that makes culture in this city a driver that transcends the artistic fact. It is also a driver of social, and educational transformation" - Horacio Rodríguez Larreta, Head of Government of the Autonomous City of Buenos Aires. "We are in a moment of social transformation in all areas that must be accompanied by a backpack of values, vision and culture. The challenges ahead cannot be met without talent, and we need to give space to talent in spaces of culture and sustainability such as this one in the agenda of cities" Emilia Saiz, Secretary General of UCLG. Parallel sessions were held throughout the morning on how culture and the heritage of a city are capable of mobilizing citizens for such important actions as raising awareness about climate change or educating the youngest. Wednesday afternoon also witnessed a transformative exchange of ideas in the Plenary. Under the title "Now or never: the impact of cultural policies and practices" cities such as Lisbon, Mexico City, Berlin, London, Washington and Buenos Aires presented multiple cultural practices that coexist in cities thanks to a host of conditions that favor social inclusion among neighbours, which in turn transform the neighbourhoods and the quality of life of the population. “In Lisbon, new inclusive cultural facilities, such as the Marvila library, contribute to cultural participation but also broaden opportunities for social and economic development. “ Catarina Vaz-Pinto, Councillor for Culture, Lisbon. Also, through several parallel sessions, participants were invited to create synergies through cooperation between peers with innovative and multidisciplinary perspectives and long-term projects to reach more people. More #UCLGmeets tomorrow on the second day of the UCLG Culture Summit with the celebration of some of UCLG's Policy Councils. Stay tuned to #CultureSummit for more! The morning of the second day of the Summit saw the promotion of gender perspectives to rethink cultural policies around Sustainable Development Goal 5. 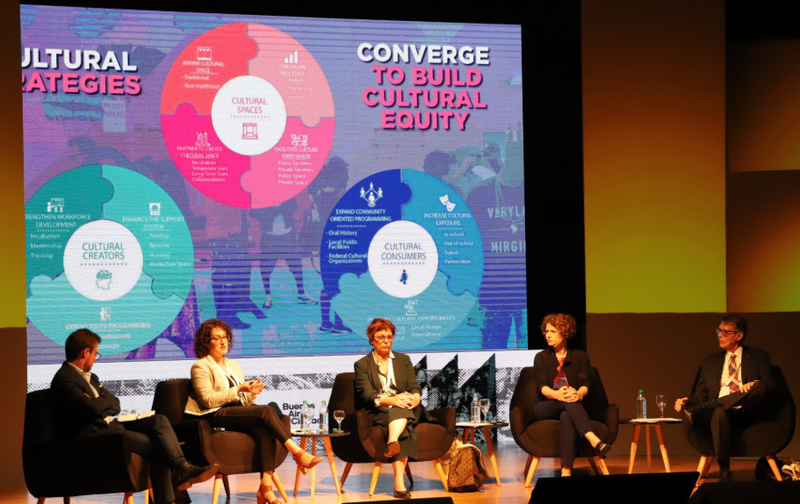 Mariana Percovich, Director General of the Montevideo City Council, highlighted how Montevideo has strengthened the culture of the city with a gender dimension in recent years by stating that "the cultural field remains unequal, and that women are underrepresented in local art. We need gender perspectives to intervene in artistic spaces in cities”. UCLG's Policy Councils, which take place within the framework of its Executive Bureau, began to be held within the framework of the summit, with the aim of integrating the cultural dimension at the heart of the organisation's political debates. The first meeting dealt with the "Implementation of the cultural rights of the city" under the auspices of the UCLG Policy Council on the Right to the City and Inclusive Territories. Thanks to the open and enriching dialogue between all local governments and cities, initiatives and proposals were collected on how through some aspects of the right to the city, such as free expression or access to pratimony, the cultural rights of citizens can be guaranteed and make territories more just, inclusive and sustainable. "Cultural rights are part and parcel of our coming work: particularly when it comes to addressing concrete human rights, both emergent and long-standing" Berry Vrbanovic, Mayor of Kitchener & Treasurer of UCLG. The meeting "Generational dialogues and creativity: strategies for youth", which took place under the auspices of the UCLG Policy Council on Opportunities for all, culture and city diplomacy, served to bring to the political debate the need to integrate all citizens in the development of culture, including children and young people. Proposals were exchanged to build mechanisms of intergenerational collaboration to build cultural policies also sensitive to the needs of future generations. Parallel sessions that provided opportunities to share cultural factors that serve as a bridge to local sustainable development (such as technology, the role of culture and resilience, culture in public spaces, among other issues…) were held throughout the day. The third day of the Summit began with the session "Experimenting with creativity in public spaces", held under the auspices of the UCLG Policy Council on Safer, Resilient and Sustainable Cities. 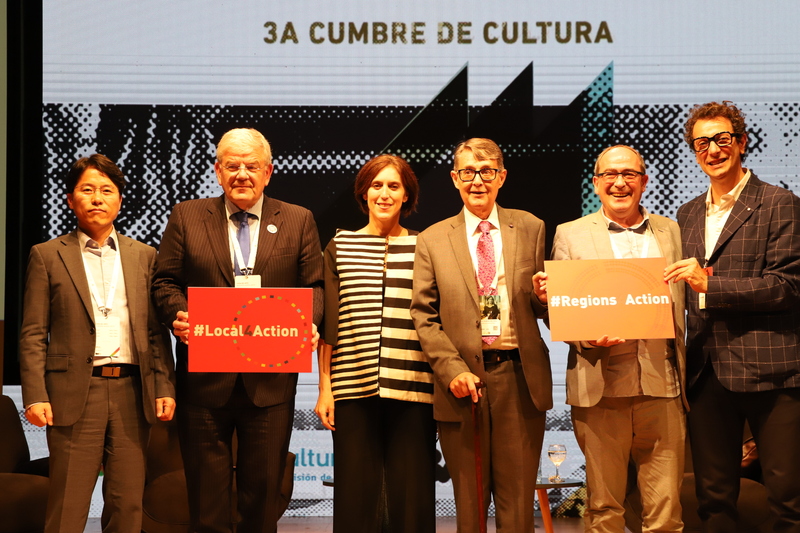 This session, which is a part of the UCLG Executive Bureau and is also integrated into the Summit, served to gather initiatives on how citizens can better appropriate public space through culture and creativity in order to make cities that foster coexistence and that are safer and more sustainable. Throughout the day there were parallel sessions that focused on local network strategies at the international level and their linkages with academia and the third sector to share data and research that gave a better understanding of urban cultural dynamics. The UCLG delegation was particularly present in the session "Cultural and Natural Heritage in Cities". At this meeting, the Secretary General of UCLG-Africa, Jean Pierre Elong Mbassi, and the Secretary General of UCLG-Eurasia, Rasikh Sagitov, had the opportunity to share relevant examples of how cities are redoubling their efforts to safeguard cultural heritage and it was possible to take stock of culture in the Agenda 2030 and the Sustainable Development Goals. The day ended by looking towards a "Culture 2030" Objective in a final plenary session moderated by the Secretary General of UCLG, Emilia Saiz in a dialogue between different spheres of government together with the Mayor of Montreal, Valérie Plante and the Minister of Culture of the Autonomous City of Buenos Aires, Enrique Avogadro, among others. “Culture is fundamental to the quality of life of citizens and is also a tool for social cohesion and communication, and it must be said very clearly” Valérie Plante, mayor of Montreal. 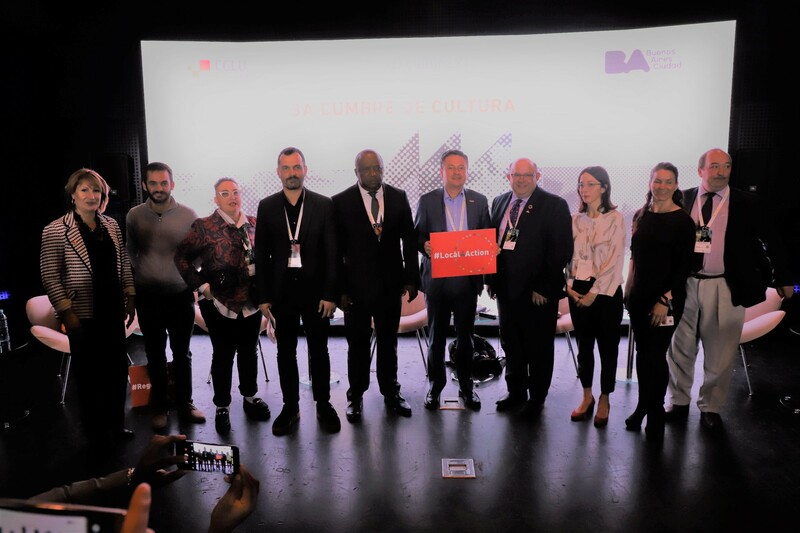 The Culture Summit ended with a closing ceremony with the President of UCLG, Parks Tau, the Mayor of Berlin, Michael Müller, as well as the Head of Government of the Autonomous City of Buenos Aires, Horacio Rodríguez Larreta, who all stressed the need to explicitly consider cultural issues in local strategies for the implementation and localization of the SDGs, as this is a key condition for their achievement. 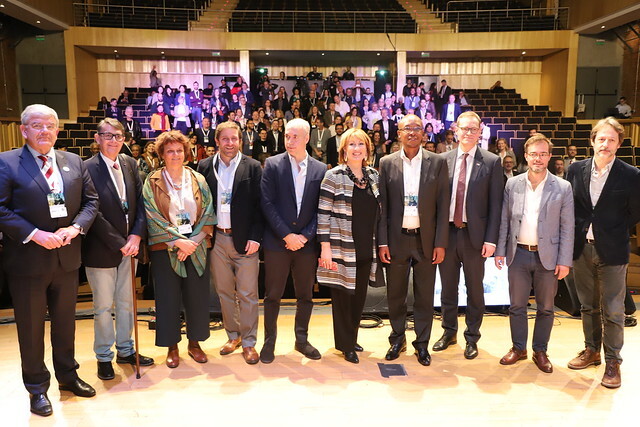 “It is important to emphasise the important work done by the Pilot Cities of the Agenda 21 for culture, which is pioneering and inspiring to many other cities in the UCLG network.” Parks Tau, President of UCLG. 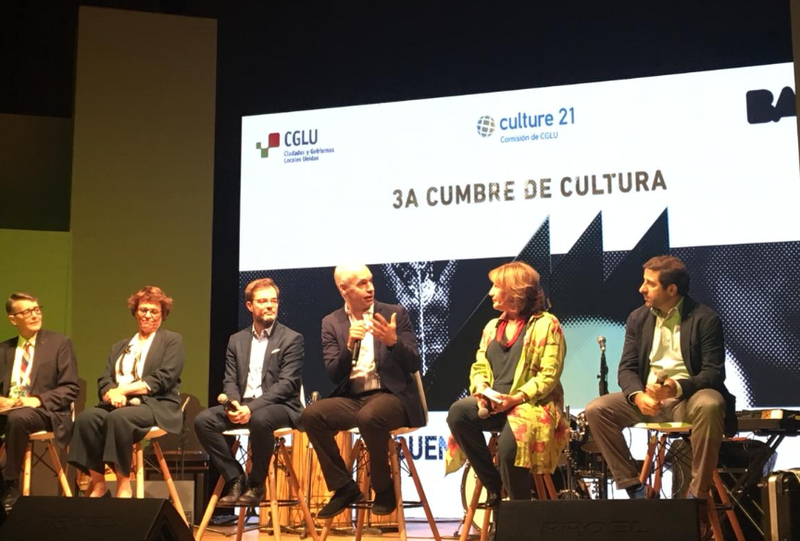 “It is important to strengthen the connections between culture with other dimensions of urban life and to work with cultural actors to create the proper conditions and spaces for culture so it can thrive” Michael Müller, Mayor of Berlín. This UCLG Culture Summit left a clear message: culture is a key dimension of local development, as development agendas cannot be reached without a deep knowledge of local contexts. Only by knowing the culture and reality of each place will we be able to locate the agendas by putting creativity and knowledge between local stakeholders in the first place. We will continue tomorrow with more #UCLGMeets at the Executive Bureau of UCLG in Montevideo! See all the highlights of the Culture Summit also at #CultureSummit. The working sessions of UCLG's Executive Bureau began on the morning of Saturday 6 April with several parallel meetings: the Financial Management Committee, the Executive Committee of UCCI and the political debate of UCLG's metropolitan section (Metropolis). The Committee on Statutory Affairs, the meeting of the Executive Directorate of Mercociudades and the meeting of the Working Group on Territorial Prevention and Management of Crises also took place during the morning. The opening the UCLG Executive Bureau was attended by UCLG President Parks Tau, Mayor of Montevideo Daniel Martínez, Berlin Mayor and Metropolis President Michael Müller, Mayor of Rosario and UCLG Vice-President for Latin America Monica Féin and Ariel Bergamino, Undersecretary for International Relations of Uruguay. "We have to lead the way for the international system to follow. Local and regional governments are listening: our communities are asking us to be brave and to lead the way towards a transformation that will leave no one and no place behind.” Parks Tau, President of UCLG. The Business Session of the UCLG Executive Bureau addressed some of the political issues that are and will be key to the Organisation and the global municipalist movement throughout 2019, such as Gender Equality , the role of local governments in managing migration and crises management, or its International Advocacy Agenda, which focused on two key milestones. The results of the UCLG Culture Summit that was held in Buenos Aires were further presented during this sessions. The Executive Bureau further discussed the organisation of the UCLG World Congress, which will take place in November 2019 in Durban-eThekwini, and which will be a key space for the municipalist movement, as well as for the future of global governance. "As the host city, we see this meeting as the time to advance the agenda of local governments at the international level, and we hope that participants can have a real African experience in Durban!" Ntandoyenkosi Lucky Khuzwayo, Councillor of eThekwini-Durban. Finally, the members of the Bureau acknowledged the more than thirty years of work in the service of local governments of UCLG honorary treasurer Heikki Telakkivi, who was retiring, and welcomed the new treasurer, Maria Julia Reyna, Secretary for IR and Integration of Santa Fe. Take another look at all the details and highlights of this UCLG Executive Bureau and Culture Summit at #UCLGMeets and #CultureSummit!